Such a sweet take on the cue card, Joyce! Beautiful coloring on these images, too! that is exactly what I thought of and this is adorable. I like the edge of colouring around the images-hope all is well with you buddy! Oh, what a CUTE take on the cue word Joyce!! They are a sweet pair aren't they! Oh...such a sweet card! I remember you making this while I was visiting, forgot all about it. Just love that those sweet critters are roasting marshmallows, so yummy! That is exactly what I thought, too ... thanks, bud! Darling card! I have this set and loved what you did with it!!! I love your interpretation of this week's cue card Joyce! What a perfect stamp set to use for BUD! Looks like your best buds are having fun! 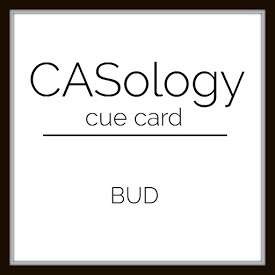 Love your take on the cue word!